The more the pre-draft process works through, the more Saquon Barkley becomes myth, legend or superhero in the eyes of some. I have seen him called the best running back prospect in decades, a likely No. 1 overall selection (which would be the first time a running back has gone No. 1 since 1995), and even seen it reported that some team has given him a ‘perfect’ grade in their pre-draft scouting. This was likely always coming, given his athletic profile and the inevitability that he would blow up the NFL Scouting Combine in February, but it still feels like a runaway train that needs somebody to pull the brake. Before we get into the negatives though, let’s take a look at what everybody loves about Barkley and why he is the consensus No. 1 back on everybody’s draft board. Barkley is one of the most talented receiving backs to come along in years (Alvin Kamara not withstanding), and in a league where passing reigns, that has never been more important. Some of the game’s most dynamic receiving weapons succeed largely because they cause inherent matchup problems for defenses, and that’s exactly what Barkley can do. He is a 233-pound back that can be split out into the slot or out wide as a receiver and toast a linebacker in single coverage because he runs a 4.4-flat 40. He has the explosiveness to make even defensive backs look foolish and the kind of power that those players can’t contain even if they are able to match him in speed or quickness. Barkley ranked fourth in the draft class last season in yards per route run with 1.90 and had almost twice the yardage and receptions of any of the three backs ahead of him in that category. His flair as a receiver makes him worth more in today’s NFL than a back that struggles in that facet of the game. Teams pass an average of 58 percent of the time, and PFF’s Expected Points Added (EPA) numbers state that passing is inherently more valuable on a given play than running the ball is. A running back that is a more dynamic receiving weapon than he is a ball carrier is quantifiably more valuable in today’s NFL than one with the reverse skill set, which is what separates Barkley from his peers in this draft class. That’s not to make out that Barkley is just a receiving back, but it is clearly what he is best at, and what makes him special rather than just another talented back in a talented class – he is PFF’s No. 1 ranked running back prospect in this draft for a reason. It’s somewhat ironic that for a position called ‘running back,’ the rushing aspect is where Barkley struggles – at least comparatively. That’s not to say Barkley is a bad ball carrier, because he isn’t, but he isn’t sensational, either. The highest PFF rushing grade Barkley ever received over a season was 87.3, which also represented his highest rank in the nation – ninth. As a pure ball carrier, I’m not sure Barkley would rank in the top five among running back prospects in this draft. Again, that’s not necessarily a bad place to be – this is an excellent running back class – but neither is it special. The criticism of Barkley’s rushing game isn’t to suggest he is lousy, but it’s to articulate certain stylistic tendencies that scare people. His biggest criticism is that he’s looking for the home run every play, and sometimes passes up the necessary single to try and find it. That can get him into trouble, as he is more likely to put his offense in a hole with lost yardage or simply leave yardage on the table, leaving them well behind the chains. 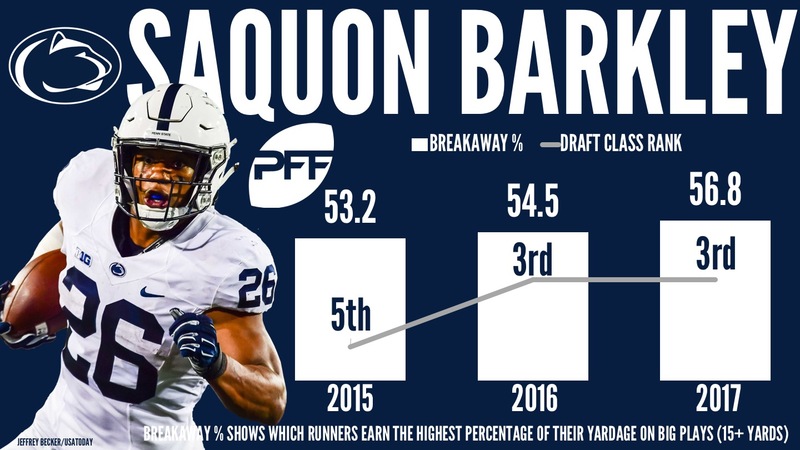 The big number that illustrates this is that on runs where he was contacted at or behind the line of scrimmage, Barkley averaged just 0.46 yards per carry, which ranked 57th out of 58 qualifying backs in this draft class. This isn’t necessarily a comment on his overall ability, but it is a stylistic indicator. LeSean McCoy was bottom of the NFL in the same category last season (0.37 yards per carry), for the same reason, but it’s fair to say he’s been a pretty useful back as a pro. Some of this is impacted by the run concepts and scheme employed at Penn State, as well as the fact that their offensive line wasn’t the best in the world. The team placed Barkley on a wide track a lot, giving defenders more time to hit him close to the line of scrimmage. Overall, he was hit at or behind the line on 44.5 percent of his carries, which is higher than all but three other backs in this draft class (one being Nick Chubb). On all zone plays, Barkley was hit on average after just 1.6 yards, compared to 3.5 when the team ran power, which is obviously a significant difference, but Barkley was also a significant factor in some of the negative plays. Zone plays generally give the running back multiple possible points of attack to hit, relying on vision from the back to find the right hole versus power plays with a specific intended point of attack. If you factor in the yards after contact before the runner gets back to the line of scrimmage, Barkley jumps to 2.48 yards on average, which looks a lot healthier, but that figure still ranks lower than any other top prospect in this draft. Barkley had the fourth-highest percentage of runs that changed gaps due to the running back voluntarily bailing on the hole, and you never have to wait long if you throw on tape of any of his games to see a play in which it happens. Part of the reason that Barkley chases those home run plays is because he is a home run hitter. 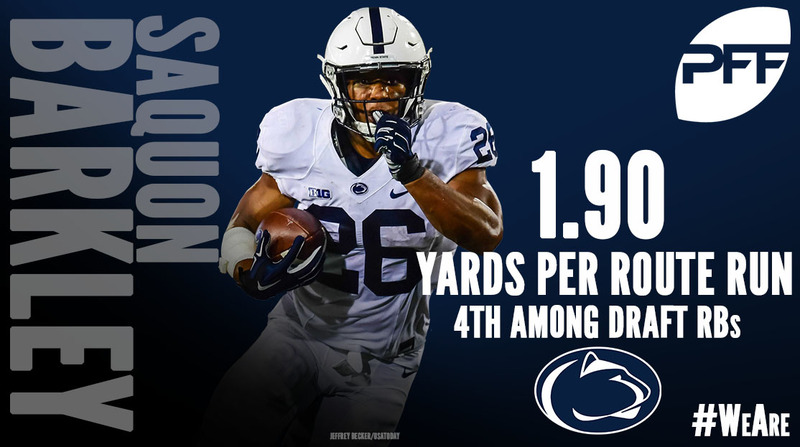 He had 19 runs of 15 or more yards this past season for a breakaway percentage of 56.8, his third straight season with more than 50 percent of his yards coming on those explosive runs, and his third straight season ranking inside the top-5 in this draft class in that category. If Barkley is able to spring into the open field, he can take it to the house in an instant because of that athleticism and raw speed. What this does is make him extremely dependent on the offensive line blocking for him – more so than other backs in this class that are generating more of their own yardage and picking up modest gains between the tackles and through contact. That could mean that if Barkley lands in the right situation in the NFL – behind a quality run-blocking unit – he could look sensational in any given season in spite of his big play chasing mentality. As we have already mentioned, receiving prowess is more important than rushing the ball even at the running back position, so Barkley should succeed despite his flaws. The questions that will be posed to NFL teams are whether his style of rushing is a big enough problem from an efficiency standpoint to prevent him being a bellcow in that regard, or alternatively whether you can teach a big-bodied back to run like a bulldozer if his natural tendency is to try and avoid contact in the way a 190-pound guy might. If you convince Barkley to use his size and strength in the way Nick Chubb does, run the way Ronald Jones does between the tackles, you would quite possibly have this mythical, superhero running back prospect that some are talking about. As things currently stand however, you have an interesting player who is weaker at the traditional position role but is also spectacular at the part of the game that has become more valuable in recent seasons, an aspect of his game that keeps him atop PFF’s draft board of backs despite his high-variance rushing style.